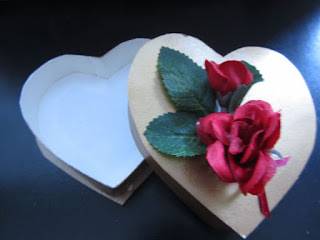 This is the last of the homemade Valentine's gift items that I'll share with you this week -- a handmade, heart-shaped box for the chocolates that I made. BTW, I made dark chocolate almond clusters to go with the heart-shaped chocolates. Nut clusters are a type of candy that are super simple to make, and I wanted just a little more candy for my family members. Back to the heart-shaped boxes. These definitely took some patience. But I think that they turned out nicely for a homemade box. I used a cracker box for the fronts and backs of the boxes, a thin sheet of poster board for the sides, glue, white paper, gold spray paint, silk roses/leaves and satin ribbon from the free box of craft supplies that I got last summer, scissors, and box cutter. After opening up the cracker box to lay it flat, I cut a heart out of white paper, then traced around this heart onto the cracker box sheet. This became my template for the remaining heart tops and bottoms. 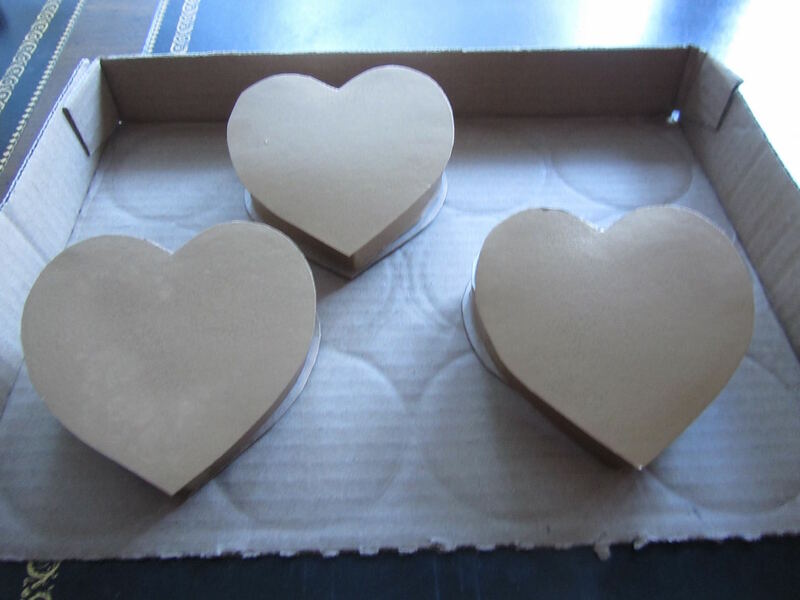 I traced around the first cardboard heart on the rest of the cracker box, 6 times, then cut out all of the hearts. I also cut 6 hearts from a sheet of plain white paper, trimming them down about 1/4-inch all around. I used the box cutter to cut long strips of the poster board. After cutting the strips, I scored each along the long side about 1/3-inch from one edge. I cut tabs all along the narrow side of the scoring. 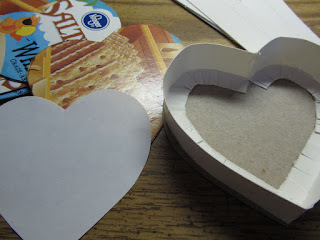 Using tacky glue, I formed the poster board strip as well as I could into a heart on the underside of the cracker box hearts. 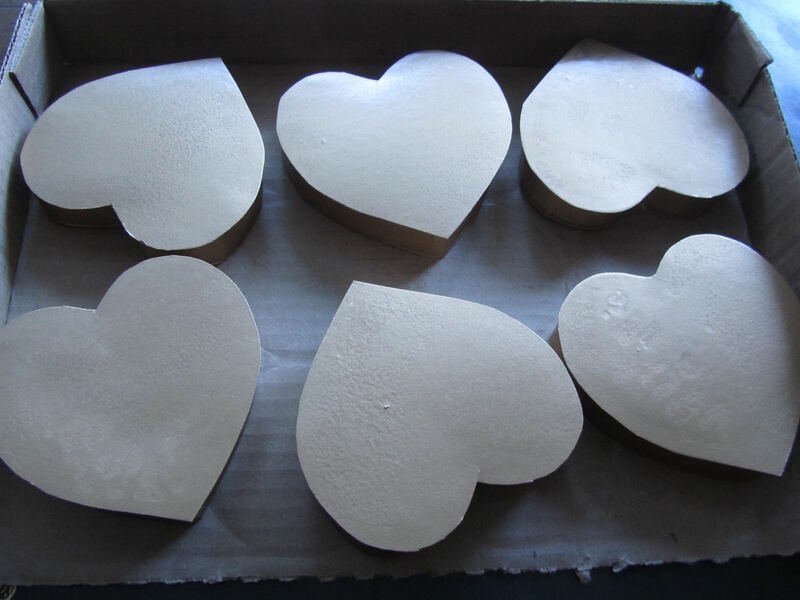 I worked in pairs, making the sides slightly larger on one heart, and slightly smaller on the other. Before setting each pair aside to fully dry, I checked to making sure the two pieces would fit together, and adjusted the sides as needed. I separated the pairs, and allowed to dry overnight. 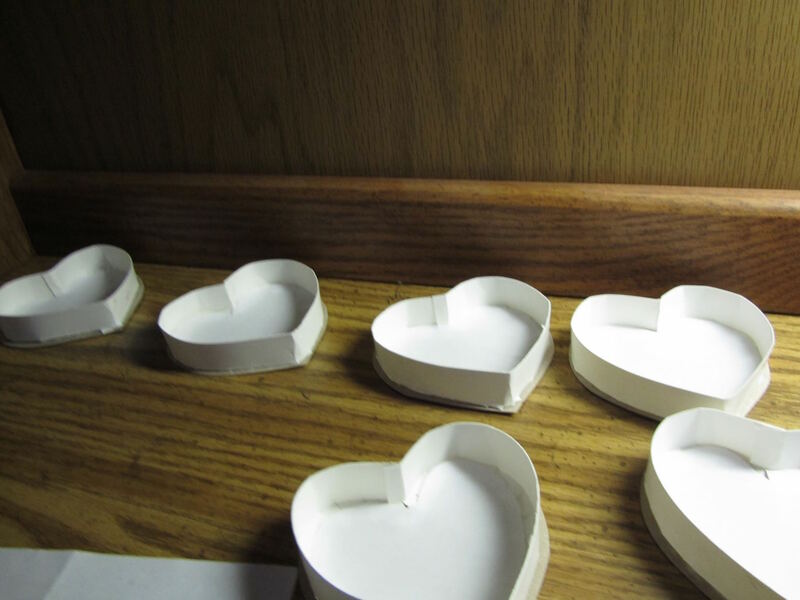 I also glued a white paper heart into each cardboard heart to conceal the rough work of the tabs glued to the base. The next day I spray painted the outsides of each box half with gold spray paint. Once the paint was dry, I matched each heart pair up again. 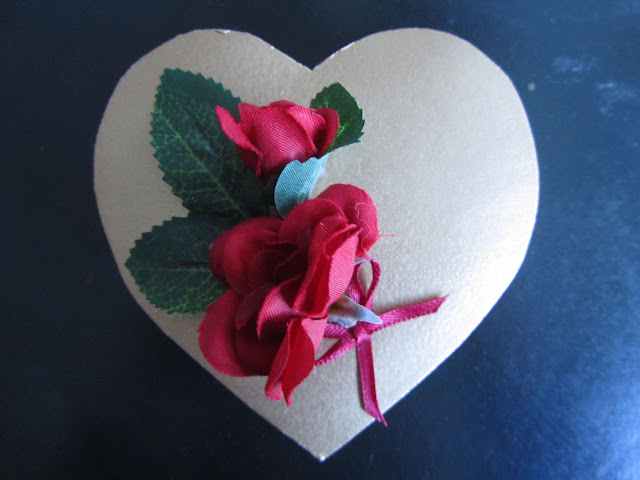 Using some of the materials that I received in the box of crafting supplies, I glued leaves, roses, and bows to the lid of each box. What I liked about this project is that many of my imperfections were concealed in one way or another. The gold spray paint wasn't completely smooth, but the roses and leaves obscured that fact. The poster board sides weren't perfectly shaped, but the overhang on the box, combined with the gold spray paint makes that less noticeable. 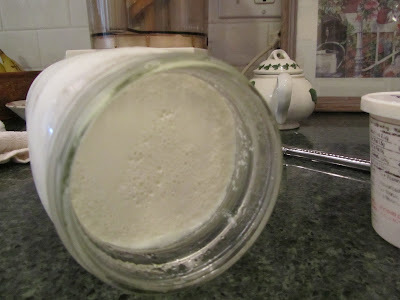 I am pleased with how they turned out and super pleased that they were virtually free. I'll let them dry completely tonight, then fill them with candy in the morning. These are lovely, Lili, as were all of your Valentine's preparations! I hope that your family will enjoy a sweet, love-filled day! I also hope that you've all fared okay in the snowy weather! Thank you, Sara. I hope your Valentine's celebrations were lovely, too! I am snow weary and will be glad when it's all gone from our yard. I need spring! These are awesome. What wonderful ingenuity you model for your family. What lovely remembrances of holidays. I hope you had a happy Valeniine's Day! Wow! Lucky for those who will receive these! Did your Valentine's plans turn out how you'd hoped? Lovely. I think boxes may have required more patience than I have. Your family is lucky. yeah, I have to admit, at one point in the beginning of making them, I did feel that maybe these would require a lot of patience. After making the first one, the rest seemed to go okay. I also had to let go of ideas of perfection or even near perfection early on. But that's a really good practice for me. I hope you had a wonderful Valentine's! Amazing, Lili, you manage the impossible! After the candy is eaten, the boxes deserve to be preserved as a keepsakes. Maybe some decoupaging? Thank you, YHF. Maybe someone will save theirs for a bit. We'll see. But now that I've done them once, I can do them again. So that's a good thing. 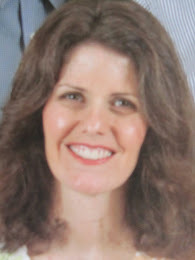 I hope that you and your husband had a lovely Valentine's Day. You definitely have more patience than I do! As the other poster said, you manage the impossible! Aw, thank you. You know, once I made one and figured out how best to do these, the others were much easier. But, yes, patience was the key, here. I hope your Valentine's Day was special!